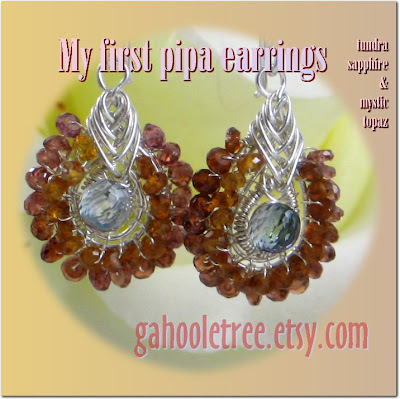 I received a very good feedback at my Etsy store, SassyDLite told me that she loved the PIPA Earrings she made out from DCH002, so I convo-ed her, asking her humbly if I could take a look at her PIPA Earrings... just a peek, I promised. Then just now, I received a very, very nice reply from her. She attached this image in the convo and told me to go ahead posting it up! And not just that! She even gave me a link to her blog (check out her Hone Your Craft article), and her new listing of these earrings. In her blog she said..
"Although I used to be a self help junky, I'm not much of a fan of jewelry tutorials. Most of them seem to be a cash grab with very little fresh and new information to put forth. But the other day I purchased my second jewelry tutorial. My first one was authored by the intrepid Eni Oken whose intricate wrapping techniques caught my eye a few years ago." Oh Wow! Very nicely done. Congratulations! Sassy. Mei, Sassy is loving this piece lol. Bobbi, thanks for assuring me that!